What is a second cousin? Not what you thought according to this tea towel. 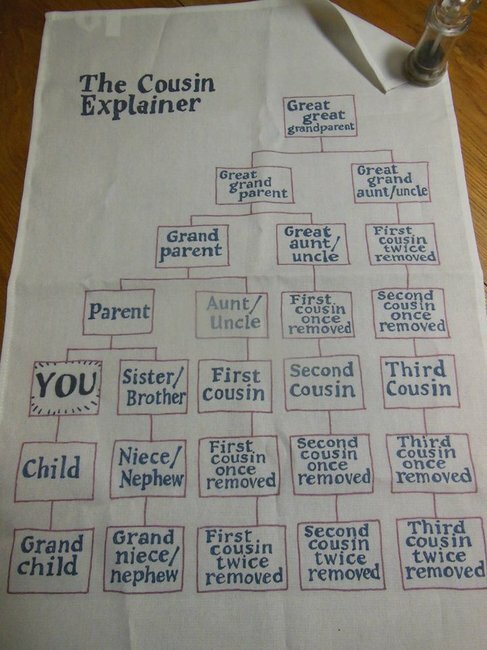 The cousin explainer: The viral diagram that explains how you're related to everyone you'll see at Christmas. I leave with a full belly because Christmas ham and pavlova and I leave with a full brain from trying to remember how I’m related to everyone in the room. But we have found a solution – and all you have to do is casually carry the below image (or tea towel if you want the real deal) around with you on Christmas Day. You see, I have more cousins than I can count on my hands and until approximately 10 minutes ago, I thought I had a whole lot of second cousins too. Now, I actually have no idea how many second cousins I have because it turns out everyone I thought was one is actually a ‘first cousin once removed’. I’m shook and I feel a headache coming on. 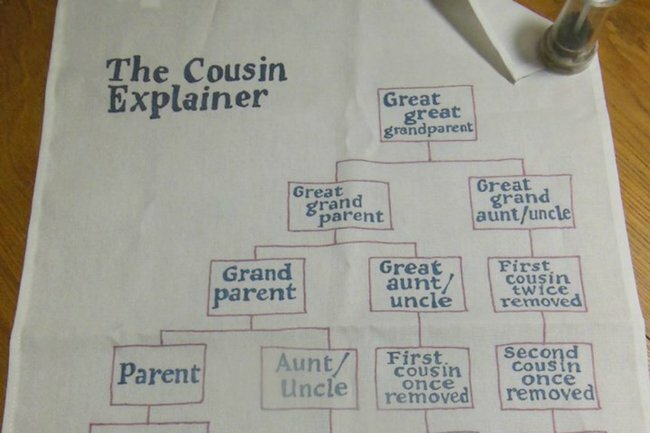 This weird moment of discovery came courtesy of a viral Reddit post featuring a diagram called ‘The Cousin Explainer’. It&apos;s really helpful and yet somehow really bloody confusing at the same time. After some intensive investigative journalism, I found the Reddit image originally came from a Facebook post by an English man whose wife prints his hand drawn diagram on tea towels for easy reference. Genius. They&apos;ve proven so popular they have sold out, but do not panic. More stock is due later this week so if you do want to wander around your family Christmas gathering holding up a tea towel, you can still do so. "Every family member is a cousin, and words like nephew just refer to very specific forms of cousins. You are your own negative first cousin. "Bonus: there&apos;s a genderless word for nieces and nephews: nibling." I uh, can&apos;t wait to catch up with my niblings and first cousins once removed (I think ¯\_(ツ)_/¯) on Christmas Day.